Posted on 5th January 2019 at 2:11 pm. Multiplayer games require communication to inform each client of the position of other players. For Sailaway the communication involves also heel, dive, heading, course over ground, speed, speed over ground, state of mainsheet traveler, state of canting keel, state of foils and for each sail the angle, and 3 shape parameters. For multi-crewed boats all the setting of trim lines are communicated as well. Other communication involves the colors and textures of the boats and the in-game chat. But the most crucial one is the communication of the position, speed, etc. – Make the clients communicate to each other directly using PtP communication. Sailaway has chosen for the first option. In order to make the positions of other players on the screen as accurate as possible, the communication should occur as often as possible and as fast as possible. Many First Person Shooter games let their player’s computers send position update messages 3 to 5 times per second. The capacity of the server, the bandwidth of the server connection would soon be consumed completely. And even if this would be limitless, the capacity and bandwidth of the player’s computer would become the bottleneck. To overcome this problem players are often grouped together in “game rooms”. This way the number of players per game room remains under control. Sailaway takes a different approach, because there is only 1 game room with all players anywhere in the world online. Another problem all games experience is internet latency. It can easily take up to 200ms or much more for a message to reach the server and from there another 200ms to reach another player. To overcome this problem game rooms are often assigned to specific servers that are located near to the players in that room. But Sailaway uses 1 server for all players and therefor all these quickly described problems will apply and make it unplayable if nothing is done to prevent that. – clients that try to limit the number of messages they send out. There is more than just the boat positions to synchronize in Sailaway. 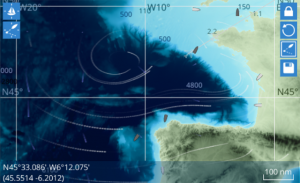 Since waves and wind shifts and gusts also influence the speed and behavior of the boats, it is important that these are identical on every computer as well. Rather than sending messages back and forth to synchronize them, each computer creates it’s own waves, gusts and shifts. It uses an algorithm for this with 2 input parameters: world coordinates and time. Now if each computer uses the same algorithm and has the same input, all players will experience the exact same waves and wind. It is vital that the time is correct, not just for waves and wind, but it is the basis of all multiplayer communication in Sailaway. It influences the positioning of boats and determines who passes the finish line of a race first. More about that later. Since there is no guarantee that all computer clocks run exactly on time and are correctly set up, Sailaway uses it’s own internal UTC time. Basically the time from the server is requested upon login and the player’s computer updates this time constantly so that it is always up to date. But this will result in discrepancies between players. To eliminate these, the internal clock is updated with the server time every 5 seconds. If the difference between the internal clock and the time on the server becomes smaller, the update frequency dynamically goes down to every 30 seconds. And when the discrepancy grows the frequency increases again. The clients sends out a time request, the server receives it and sends the current time as an answer. When the server’s time arrives at the client, it is already outdated. To compensate for this latency, the client measures the duration between sending the request and receiving the answer, divides that by 2 and adds it to the time received from the server. The bigger the duration was, the less reliable the server time is. So instead of resetting the internal clock to the new server time, the new server time only nudges the internal clock to run faster or slower. The force of that nudge depends on the reliability of the newly received server time. Together with a few other subtle calculations this makes the internal Sailaway clock of every player to run well within a margin of -20 to +20ms from the server time. When a client receives a position update or sails update from another boat, the first thing that happens is that the boat is looked up and if it doesn’t exist yet, it is instantiated. Before version 1.1.11 the boat would be instantiated upon a position update or sail update, but it would not store that information immediately. It therefor had to wait until the next update was received before it would become visible in the world. As of 1.1.12 the instantiated boat immediately stores any information available for later use. This has a significant effect on the time it takes before a boat appears on the screen. If there are for instance 100 boats in the neighborhood, the client would have to send 100 requests to the server. Since that would be highly inefficient, the ids of the newly instantiated boats are collected and after max. 2 seconds a single request goes out the the server to provide the necessary information about the appearance of those boats in 1 go. The sails info is also send periodically by the other boats and contains info like which sails are raised, at what angle are they, how curved are they how far open is the top of the sail, etc. before all the necessary info is received, but then the model of the boat is placed in the world and the user can see the other boat on the screen. – when it has been longer than 2.5 times the interval for boat position updates since it last received any updates. The copy of the other user’s boat behaves like any other boat. It has a speed and a course and it travels in a straight line even if no position updates are received. It moves with the waves, it speeds up when going down a wave and slows down when it climbs a wave (this works because all waves are computed with time and location as input and since the time is synchronized, the waves are synchronized as well). When the client receives a new update, it knows when the message was send and it knows what time it is upon receive. Together with the course over ground and speed over ground, the received position is extrapolated to a new position for the boat. This should take away any delay caused by internet latency. Now that an exact position is known, this new position update is compared to the current position of the boat on the receiving client. 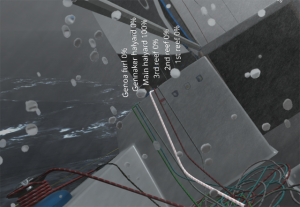 This copy of the boat has been sailing since the previous update and it is likely that the computed position is not identical to the newly received position. The position difference and also the heading difference is gradually eliminated by speeding up/slowing down/turning the boat. As of version 1.1.11 this done by honoring the physical mass of the boat so that the correction will look as natural as possible. The frequency decreases when there are a great many boats in the neighborhood to prevent flooding the clients with updates from all these boats. Half the updates contain only the latitude, longitude, COG and SOG to minimize the bandwidth used. The other half of the updates also contain heel, nose dive, lift and a status whether the boat has ran aground or has capsized. When the boat is changing course a full update message is forced every time. The messages are send to every boat within a rectangle of 1.2 degrees longitude and 0.8 degrees latitude. The last one is not really a sail related parameter, but it is passed to other clients because it affects the appearance of the boat. The update is always for all the sails that are (partially) raised and it is send every 30 seconds. This interval is rather big, but as soon as one of these values changes the interval is gradually reduced to a minimum interval of 1 second. A boat can not be shown on the screen of another user until this message is received at least once. The computers of all online crew members compute their own speed, heel, etc. which is fine for the periods in between updates from the server, but only 1 client can determine the actual position and other parameters of the boat. This client is identified as the skipper. There can always be only 1 skipper. Usually this is the owner of the boat, but when he is not online a random other crew member will immediately take over. If the current skipper doesn’t log off correctly, the game will still assign a new skipper after a while. The skipper has a few more authorizations than the other crew members. He can change the skills level (unless this is determined by the race or challenge), the auto navigation and the settings for offline sailing. Only the owner of the boat (when online he is also the skipper) can change the appearance of the boat and can edit waypoints. The skipper will send periodic position updates for the boat, that are received by other boats, but also by the crew members. The position updates are used by the crew’s computers to correct the position, heading, heel, dive, lift of the boat. These corrections will to be minimal since all computers use the same program, the same wind, the same waves and the same time. Any corrections are implemented with respect to physics and the mass of the boat. Any crew member can change a control or steer the boat. But when they do, the control first needs to be locked. This lock message is broadcasted to the other crew members to notify them that the control or the helm is currently locked and prevent them from trying to pull the same line or steer at the same time. When the control is locked, the client will send new settings to the rest of the crew while the line is pulled, the foils are extended or the rudder is turned. When the control is released, the control is made available again by a release message to the rest of the crew. The skipper’s system will periodically (every 45 seconds, but never less than for 4 seconds after someone changed a control), send out a full set of all the control settings for the boat to the crew. This way it is guaranteed that all crew members share the same settings. The update also includes all sit positions of the crew members, the auto navigation settings, the skills level and the offline sailing mode. Whenever a crew member comes online, the data for the boat is pulled from the Sailaway database. But as the crew is constantly changing settings, this information may be a bit behind. As soon as the current skipper of the boat receives a message that a crew member came online, a full parameters update, including the most recent position of the boat is send to the crew. Posted on 21st September 2018 at 8:58 am. All changes to the world in Sailaway are wrapped up in a package called a “World Edit”. This World Edit defines a rectangular area in which the actual edits will take place. The function of the World Edit is to encapsulate the individual changes to the world and to make it easier for the Sailaway system to dynamically load these edits as a boat sails by. The game only has to check these rectangular areas to know which ones should be loaded into memory. So the first thing to do is create such a World Edit and define the rectangular area. It is best to keep this area as small as possible to prevent people from having to download edits that they won’t be able to see anyway. And Fastnet Rock itself is rather small, so you’d think the World Edit region can be small as well. But not in this case. The lighthouse is a tall structure and can be seen from a very big distance. The distance at which Sailaway renders any land is currently 20 kilometers. (may be we should extend this a bit). When the area of the World Edit touches this circle of 20 km, it will be loaded. The lighthouse is 48 meters tall and can be seen at a distance of 16 miles or 29.5 kilometer. And this means that the World Edit has to have a size of 9.5 x 2 = 19 km square. This roughly equals 10 minutes latitude by 16 minutes longitude. The maximum allowed size is 1 by 2 degrees, so we are well within the limits. The lighthouse has a range of 27 nautical miles which is more than those 16 nm. This is due to refraction of the light by the atmosphere. But luckily the Sailaway system that places buoys and fixed lights will take care of this. So there is no need to extend the World Edit rectangle any further. 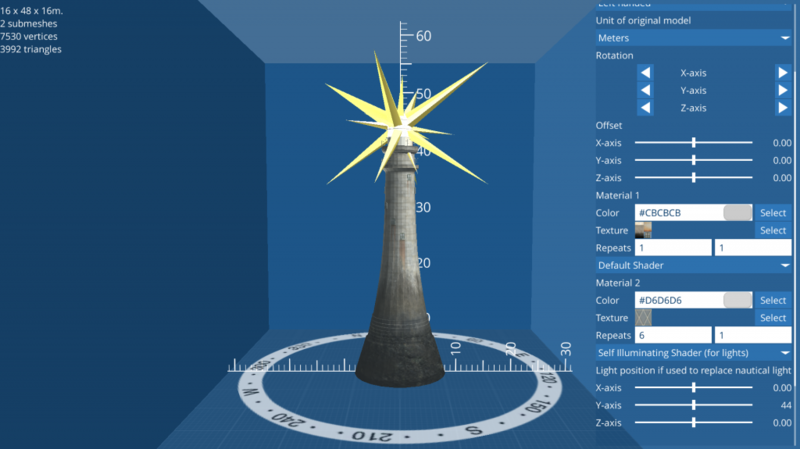 The lighthouse won’t be rendered, but the light will be visible anyway, since this is already defined in the database of nautical objects that Sailaway uses. First I am going to edit the terrain heights, because the entire island is nowhere to be found in Sailaway and the ocean seems to be 34 meters deep where FastnetRock should be. 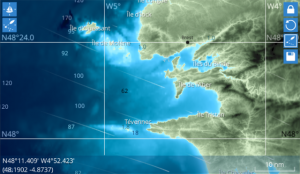 I found this section of a nautical map of the region and will use that to edit the seafloor. I clicked on “Edit Terrain Heights” and in the empty list of terrain edits, I click the + button and adjusted the area. It’s always a good idea to make the area’s for the edits as small as possible. Both to prevent unnecessary and slow downloads and to increase the resolution of your edit. The current map doesn’t look anything like the real one. I am going to make it roughly the same as the nautical chart and to do this, the current shallow area has to be removed. The center area is left alone, because that will be raised anyway. Next up is copying the depth soundings from the chart to the Sailaway map. I use the “Level to” tool, set the accurate depth, pull the effect strength slider to the right for 100% effect and click once in the map to make the depth match the chart. It’s easiest to start from the deepest level with a big brush and work towards the shallower depths with a smaller brush. The sea bottom becomes a bit polka dot, but there is not much you can do about that. Except for using the “Smoothen” tool a bit. In the tool “3D models’ I added a new object for the island, placed it roughly on the spot where the default lighthouse is on the map (I’ll adjust the exact location later) and pressed “Select Model”. 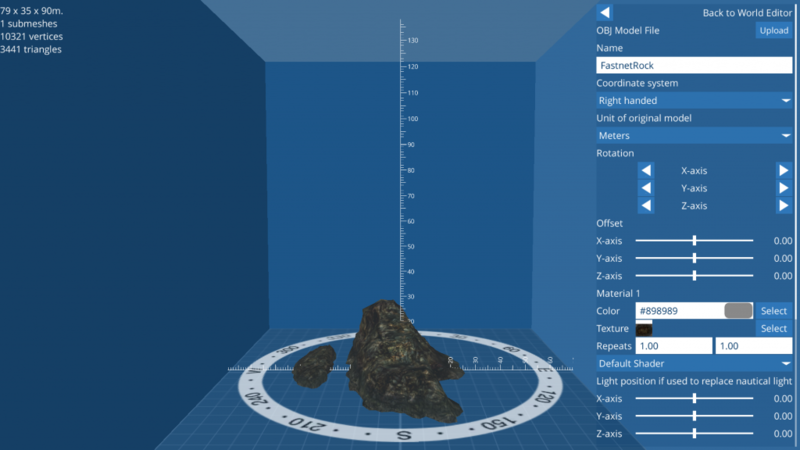 Of course there is no island in the list of models yet, so I added a new one and imported my 3D .OBJ model of Fastnet Rock that I made in Blender. I manually selected the texture I created for it, because the importer does not import the .MAT material file. The lighthouse itself is imported in the same way. But this model has 2 materials, because the light needs to shine at night. This 3rd material uses the shader “Self Illuminating Shader”. When this model is placed in the world, the light will be always on. When connected to a nautical object, it will replace that object and uses it’s light signature. To add an actual light to it, I set the light position with the sliders at the bottom. This will add the ugly Christmas star that you see, but that’s only in the editor so you can see where the light is situated. And finally I place them both in the world by adding the 3d objects to my World Edit. It took a little tweaking to position them correctly. 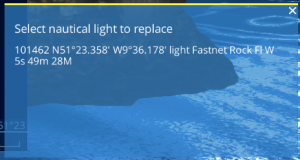 To replace the existing fixed light with this new lighthouse, I used “Replace nautical object” and select the lighthouse in the list. The lighthouse has started flashing now. And this is the end result. 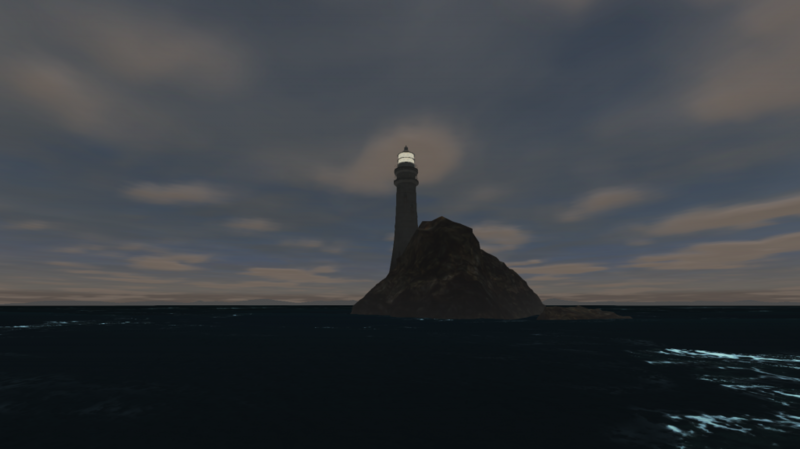 When the new update for Sailaway is published, this lighthouse and all other edits to the world will be visible for everyone who sails in the area. Posted on 4th May 2018 at 11:36 am. Ideally the Sailaway world would be an exact copy of the real world, with the same water depths, the same landscape and the same buildings and vegetation. Of course this is impossible. The world is simply too big, the Sailaway Team is simply too small, and the available information is simply too scarce. We’ve decided to make more use of the enormous expertise that is present among the Sailaway sailors and intend to create a World Editor. This is what I am working on right now. I’d like to share my ideas with you and appreciate your input in case I forgot something or if you think a different approach would be better. The World Editor will be a separate program in WebGL so it will run in your browser. Embedding it in the Sailaway executable would make the program and the user interface overly complex. The downside is that it will be an extra program to maintain and support. All edits are encapsulated by a world edit object. This world edit object will contain the id of the user, the longitudes and latitudes of the edited world section, whether the edit is published or not and a publication timestamp. If there are multiple world edit objects for the same area, they will be applied in the order of publication. To allow 2 people working in the same area on different world edit objects at the same time, new height values are only stored when they have actually been changed with respect to the original height. This means you can work in the same region as long as you don’t edit the exact same location, because then the one published last will determine the terrain height for that position. Of course there is the danger of someone pushing out weird shaped islands, drawing their name in the terrain, or making unintended errors. If this happens, you can disable those edits in the stack. If it was done intentionally, notify us and we’ll address the user to prevent future incidents. The terrain heights are stored in a grid format that uses 2 bytes per sample. Since the range is -10000 to +10000 meters, the accuracy would be insufficient for detailed editing. For this reason Sailaway uses an algorithm where steps are smaller around 0 and bigger at greater depths/heights. 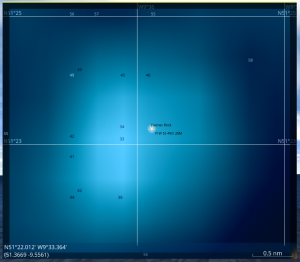 The current Sailaway terrain heights have a resolution of 30 meters. The world edit object will allow much higher resolutions, but the download size would become immense if even a small region like “The Netherlands” would be stored in a resolution of for instance 1 meter. It would mean a download size of 250 km x 150 km x 2 bytes = 75 GB. 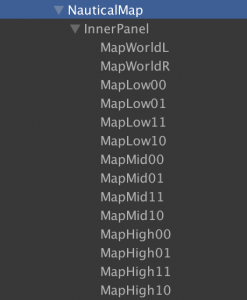 To prevent this, you can use multiple edits within the same world edit object with different scales. The best way to edit an area would be to start at a big scale and then create separate height edits for smaller regions where you need a high resolution. Here’s an example for the port of Rotterdam. First you edit the whole region N51.91, E3.95 to N52.05, E 4.175. This region measures 0.095 degrees vertical and 0.225 degrees horizontal. The fixed grid size is 512 x 512 samples, which means 0.0001855 degrees by 0.0004395 degrees per height sample or roughly 22 by 22 meters. This would show large saw teeth in the landscape at close distance. To prevent this the next edit within this same world edit object could cover a smaller region. In this case N51.955, E4.025 – N51.966, E4.055. At 512 x 512 samples, it would provide a resolution of roughly 2.5 meters. And you can go much smaller than that if you want to. The high resolution edits are only downloaded by users, when they are sailing at a close enough distance to see that amount of detail. In texture mode you can paint the terrain by using a blend of predefined textures that are optimized to repeat without showing any obvious repetition. The edits are again stored in a grid of 512 x 512 tiles. The region that is covered by that grid is determined by you. This way you can quickly paint an entire desert, and create additional detail by adding world edit objects that only cover a specific beach. This works the same way as described under the Terrain Heights section. The file format uses 1 byte per tile. Each tile can display up to 16 different textures, blended together by alpha in 16 steps. 16 x 16 = 256 = 1 byte. If the total alpha of all 16 textures adds up to less than 1, the original terrain texture that Sailaway uses + earlier entries in the edit stack will shine through. Right now Sailaway reads the OpenStreetMap database to place buildings in the world. Plus we added some iconic buildings and structures at various locations ourselves (like the Golden Gate Bridge). To extend this and also allow for the creation of docks, jetty’s, dikes, sheet piling, trees, etc. it will be made possible to upload static 3D models. The required format will be .OBJ, which is very simple and straightforward and supported by most 3D editors. Each model will have only 1 material for performance reasons and .MAT files are therefor not supported. Instead, you will be able to upload a texture and/or specify a color in the editor. Transparency will be clipped by a cutout shader. After uploading an object, you specify if it is a single instance object (like the London Tower Bridge) or if it can have multiple instances (for instance a tree). If it’s a multiple instance object, it will automatically become available for everyone to use after it is published. Once someone else uses it, you can no longer upload a new version of the same object. Placing the objects in the world is done by placing them on the map and adjusting the scale, rotation and color. This is Richard Knol, the developer of Sailaway. I’ve been behind the scenes more recently as I have been busy working on some big changes to Sailaway. The biggest of these tasks has undoubtedly been improving the accuracy of the map data so I thought I’d give you an insight into this process in my first developer blog! The Sailaway maps are all rendered in real time based on the 3D model of the world that is stored on the Sailaway servers. This model was made with data from NASA and a few other sources and it holds the height of the terrain or sea floor at any location in the world. The NASA data only provides the height of the land, not of the sea floor. It also contained measurement errors and it has a resolution of about 10m2, 30m2 or 240m2, depending on the area. So all in all a rather depressing list of issues when you want to run a worldwide sailing simulator. Luckily there are nautical charts available that give more accurate info about water depths and much more. But charts are 2D and Sailaway uses a 3D model. Basically, a chart tells you that there are regions colored light-blue where the water depth is 0 – 10 meters, and regions in another shade of blue where the water depth is 10 – 50 meters. But what happens in between? 1280 small overview images of the actual charts. The US charts come in 6 levels. At level 1 there are large overview charts, building down to level 6 where a specific port is shown in high detail. I wrote a program that would process each of these maps starting at level1. 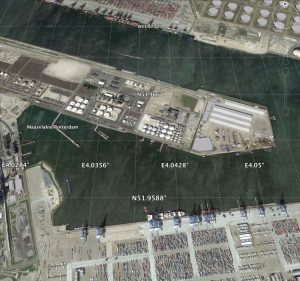 It would download a section of the Sailaway 3D model, match the Sailaway depths/heights with the data of the chart and make the necessary corrections. Unfortunately that technique didn’t work, because it would create a staircase seafloor after the depth regions of the chart are applied. And it would litter the seafloor with spikes or pits at the locations of the soundings in the chart. So instead I used the charts to verify our own data and make gradual adjustments where needed. 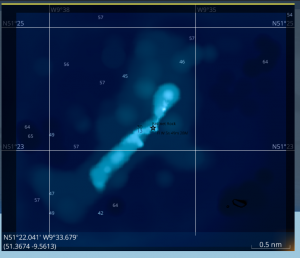 If the chart says the seafloor depth is between 20 and 200 meters, and Sailaway has 20.5 or 198, I leave it untouched. 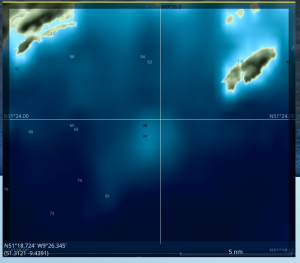 If the Sailaway model says 18 meters, the floor is lowered and also the pixels around it are lowered gradually to smooth the sea floor. This way I kept as much of the shape and structure of the seafloor intact as I could. 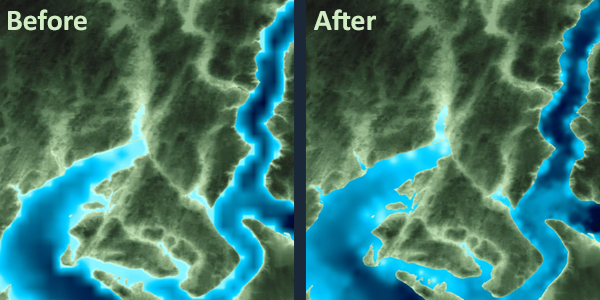 Then there was the problem of turning land into water or water into land when the coastline would not match the chart. Turning water into land without any information on what this land would look like will result in ugly terrain. There is no fix for this. Sorry. The Sailaway model is made up of 0.25 x 0.25 degree tiles. That means (360 x 4) x (180 x 4) = 1,036,800 tiles. The tiles have a resolution of 900 x 900 pixels. Each pixel is represented by 2 bytes. That means 900 x 900 x 2 = 1,620,000 bytes per tile. Times 1 million tiles is 1.5 TB of data, or 800 billion terrain heights. To process 1 chart of Level 1 (typically a region of 20 x 30 degrees) took about 2 days to compute. 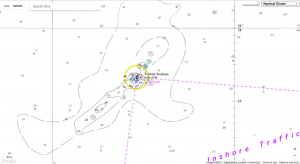 In the meantime, I read and imported all the buoys, lights, rocks, shipwrecks and other vital information from those charts into the Sailaway database. 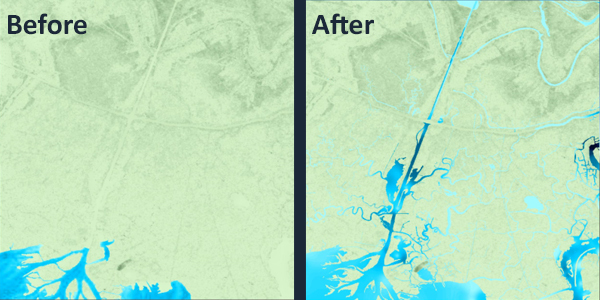 This resulted in 120,000 new objects all along the US coast. So my computer was humming and after many days, when it was already processing the charts for Level 3, I discovered a stupid mistake. Imagine a tiny volcanic island somewhere. A beautiful thing in the Sailaway maps, where you can see the slopes and the crater clearly. But this tiny island is not big enough to have made it on the Level 1 overview charts. Instead it falls in the big area indicated as 200-2000 meters deep. 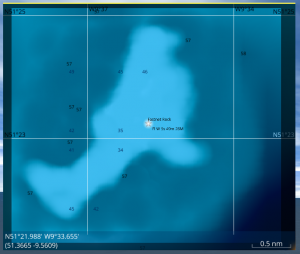 After processing the chart, the entire Island has vanished and has been turned into 200 meter deep water. Of course when the charts of level 3 are processed the island is reinstated, but all of it’s characteristic volcanic shape is gone. It is now a flat surface a few meters above sea level. As a result, the algorithm had to keep a copy of the original shape at hand. And every time it wanted to alter the current height of the land or sea floor it had to refer back to the old data and see if it could use any of the original height info to recreate some of the original shape of the terrain. The algorithm was started again from scratch. And after many weeks it is now ready with correct calculations. Yay!! 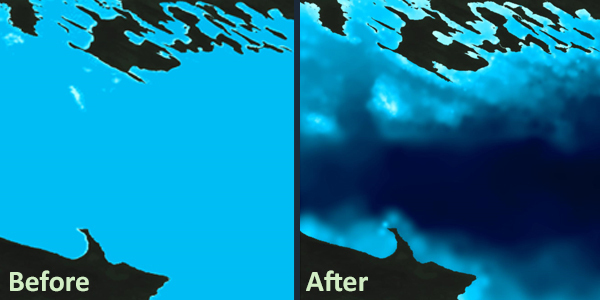 The result is a more accurate seafloor, and a very ugly coast. The last is because after processing the 2D charts, a pixel is either land or water. Imagine a nice coast with some rocks, some distant mountains, small pebble beaches between the rocks. 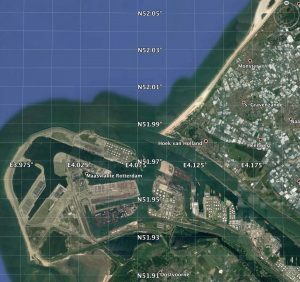 The chart may have drawn a line over that coast, dividing it into land on one side and water of at least 20 meters deep on the other. The result is a coast of steep cliffs, that plunge into 20 meter deep water. The pebble beaches are gone, and because of the size of the pixels the coast looks like a horrible collection of zigzag cliffs. To fix this, or at least make the coast look somewhat more realistic, is my challenge for the coming weeks. Wish me luck! I started work on these map improvements early August. It is now the end of October and I am not done yet and this was only the US coast! The European and Australian coast will be even more challenging. But it is great fun to work on this and see the maps improve. Sailaway becomes more mature with every step we take. I see players asking for more detail in the terrain often; for ports & marinas, and even trees and buildings. These would be awesome to have, I fully agree. But when you realize that the current work in progress coastline, made up of 10 x 10 meter pixels, already measures 1.5 TB of data. Just imagine the amount of data required when this includes the rest of the world! All that data has to be collected, processed, checked, maintained, refined and find its way to your computer somehow… don’t forget, Sailaway is a persistent online world. The world is a really big place and I hope that the process behind how I implement this accurate data has become much clearer. Please do not expect the same level of terrain detail in Sailaway that you see in other games. They do not have to carry the weight of the world with them. Thank you to all of you who have joined us in early access and support this project! I’m sure you can see from the process above, this is a passion project for me and I’m thrilled to see so many people sailing the seas I’ve created. – Richard Knol, creator of Sailaway. Posted on 8th May 2017 at 9:18 am. 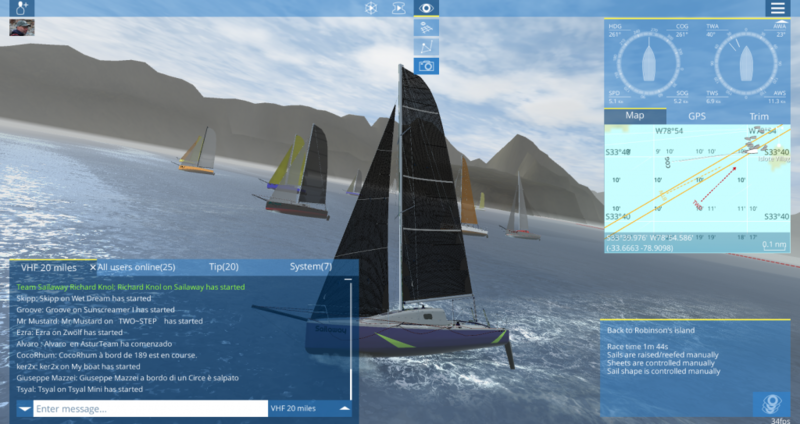 We set out the first long distance race in Sailaway as an experiment. To see if people would be engaged enough to undertake a longer event. And to test the program, to see if the waypoint system worked, see if the boats would still perform well when the user went offline and to see if everything else would work ok. It turned out to be so much more than that. Completing the race took me 35 hours. Halfway after 17 hours I was only fighting Alvaro over 3rd and 4th place with only 3 seconds between us. Nrs 1, 2 and 3 were 10 minutes ahead of us. So close. With identical boats it all comes down to sailtrim and tactics. Ker2x chose a southerly course upwind to Selkirk island and that turned out to be a wrong choice when the wind turned from South-West to West. It put him in 6th place. After we rounded Selkirk island and headed back to Robinson’s Island, 2 people took a bold decision and sailed further south. 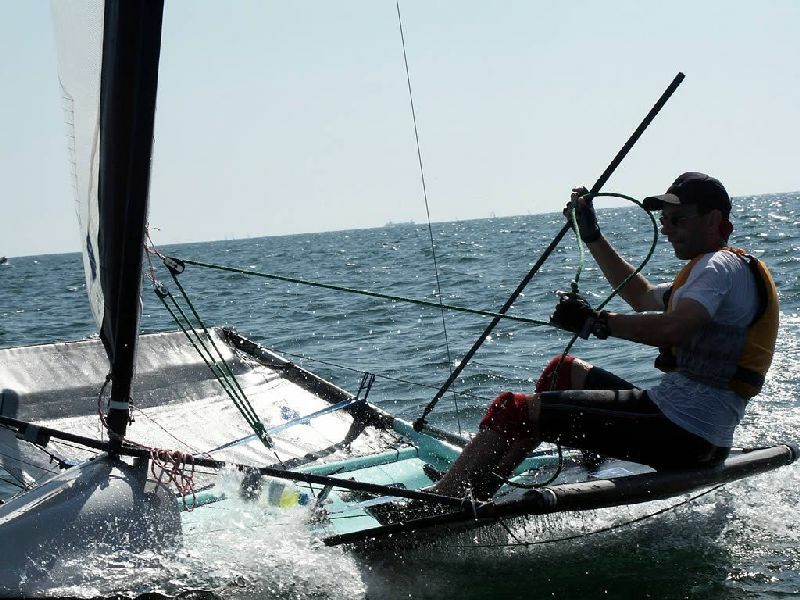 When the wind turn to North-West it brought Guiseppe a solid lead and Ker2x climbed back from 6 to 4th place. Bad luck struck Guiseppe: Only a few hundred meters before the finish line his boat ran aground in the treacherous and shallow waters while he himself was offline. Frank Black, Ezra and Ker2X and sailed passed the poor guy and ended in 1, 2 and 3. During the race you could taste the friendly competition over the VHF chat. Everyone was joking around, willing to help each other and at the same time very keen to beat everyone. It was so much fun. Posted on 24th April 2017 at 10:50 am. Today is April 24th 2017. One day before Sailaway becomes available to the public after 2 years of constant development. Sailaway’s main ingredient is passion. It emerged from a passion for sailing and for sharing that experience. Sailaway isn’t just a collection of logic and data and physics. It has been written, changed, rewritten, redesigned and tweaked until it became a true sailing experience. I hope that people will learn to sail, improve their skills, or just have fun on the water. But most of all I hope that people will catch the same fever that I have had since I was 10.